First, the good news! Thanks to your generous support, our citizens campaign for proportional representation is on the front page of the Province Newspaper today! AND - we have an 8-page ad hitting 39 newspapers in interior and northern BC later this week. AMAZING! It is only with your support that we were able to make this happen! 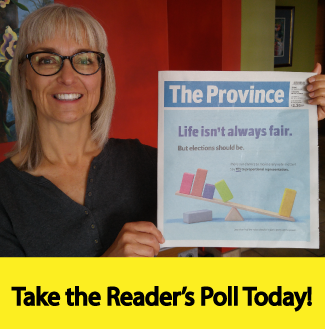 HELP NEEDED: The bad news - the Province and the Vancouver Sun newspapers are having a reader's poll today and so far, over 70% of are in favour of first-past-the-post! We can't let the NO side get this momentum and shape public impressions - right when the ballots are arriving in people's mailboxes. Please take 10 seconds to click here to take this 1 question poll - and share it with friends in BC now! The Get Out the Vote Phonebank has started! Can you join the phonebank? When you sign up, I'll send you a video of the training or you can join a live training! It's easy - you use your computer to call people on our mailing list and encourage them to mail in their ballots! This week we are focusing on hitting hundreds of thousands of younger voters through YouTube video advertising. Every dollar you donate here goes directly to turning up the daily budget so more people will see our key messages - right while the referendum ballot is sitting on their kitchen table. These are video ads you see before the video you wanted to watch starts playing! YouTube is the most affordable advertising and many more people will choose to watch videos of why they should vote for PR, and watch for longer, than they do on Facebook. YouTube also reaches young people. Young voters are the most likely to support proportional representation but the least likely to vote - YouTube advertising means we can reach more young voters right now! Right now, with our small budget, 59% of people who see our most popular video ad are choosing to watch it instead of skip it, and 60% are watching it right until the end! 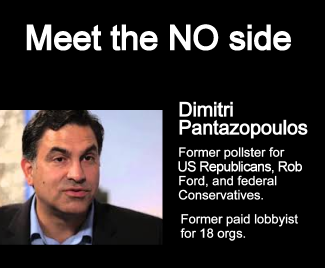 Our ads focus on "Who can you trust?" (citizens or vested interests), the problems with first-past-the-post, and the key benefits of proportional representation. Frankly, the only thing standing in the way of many, many more people seeing our proportional representation campaign videos is money. Please contribute if you can! This vote could be extremely close and this week and next week are the most crucial two weeks in the whole campaign, when most people will receive and mail in their ballots. Thank you for making everything possible. We can't wait to win a vote that counts for all of us.